EARLY LEARNING & CARE – We offer developmentally appropriate programming based on children interests. From early literacy skills to socialization and learning through play, the qualified educators at Kamloops Child Development Centre are actively involved in preparing children for the learning journey to come. Our infant and toddler program focuses exclusively on positive learning experiences. We’ve designed programs to enhance inquisitive minds and promote the achievement of ages and stages such as walking, communication, social skills and potty training. We provide an integrated learning environment for realistic experiences and goal orientated activities to build a foundation for self-esteem, kindergarten readiness and to motivate your child’s development. Our after school program is filled with fun, positive and educational activities for your child. Our motivated and energetic educators plan daily activities that stimulate and challenge your child. Children are picked up from school in one of our brand new, fully accessible, 15-passenger vans. 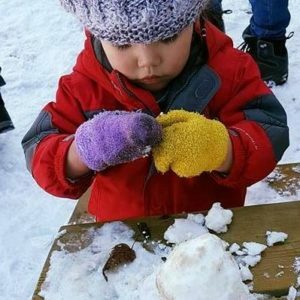 Many of the developmental tasks that children must achieve – exploring, risk-taking, fine and gross motor development and the absorption of vast amounts of basic knowledge can be most effectively learned through outdoor play.